For over 30 years, the Penderecki String Quartet (PSQ) have performed, recorded and travelled the world earning the reputation of being one of the most celebrated chamber ensembles of their generation. On top of releasing over three dozen recordings and premiering 100 new works from composers in Canada and abroad, the PSQ are dedicated educators to Laurier Bachelor of Music students and have been guest instructors at Indiana University’s String Academy, the Beijing Conservatory, the University of Southern California and the University of British Columbia. Based in Waterloo, Ontario, the PSQ have been Quartet-in-Residence at Wilfrid Laurier University since September 1991. To celebrate 25 years at Laurier, current PSQ members Jerzy Kaplanek (violin), Jeremy Bell (violin), Christine Vlajk (viola) and Katie Schlaikjer (cello), and Laurier’s Faculty of Music are pleased to present a series of events to celebrate their milestone. The PSQ will hit the stage as part of Laurier’s free Music at Noon series in the Maureen Forrester Recital Hall. As a highly anticipated favorite of the Music at Noon concert season we encourage you to arrive early to get your seat. Joined by internationally acclaimed pianist Janina Fialkowska, the PSQ will perform in this special anniversary concert featuring works by Chopin, Schumann and a new commissioned work by Ottawa composer Kelly-Marie Murphy. Tickets are available for purchase through Ticket Scene. QuartetFest brings young artists from across Canada and abroad together to participate in an intensive chamber music course and concert series lead by the PSQ and guest faculty members. As one of the most anticipated spring festivals by chamber music lovers and young musicians alike their many concerts and masterclasses will be open to the public. Calling all Alumni! 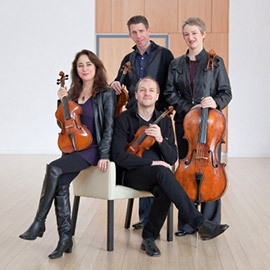 Celebrate 25 years of QuartetFest and the Penderecki String Quartet at Wilfrid Laurier University by participating in QuartetFestival, June 9 to 11. Re-form your chamber group and perform together, attend one of our student/faculty concerts, and reunite with old friends at an alumni reception.